Early this week, we heard about San Trópico, a new boutique hotel located in Marina Vallarta that opened its doors this past May and is starting to get local attention due the uniqueness of its Mexican, chic, bohemian ambiance and exquisite spaces, ideal for those looking for a quiet place to stay on their next Vallarta vacation or simply spending a relaxing day by the pool. 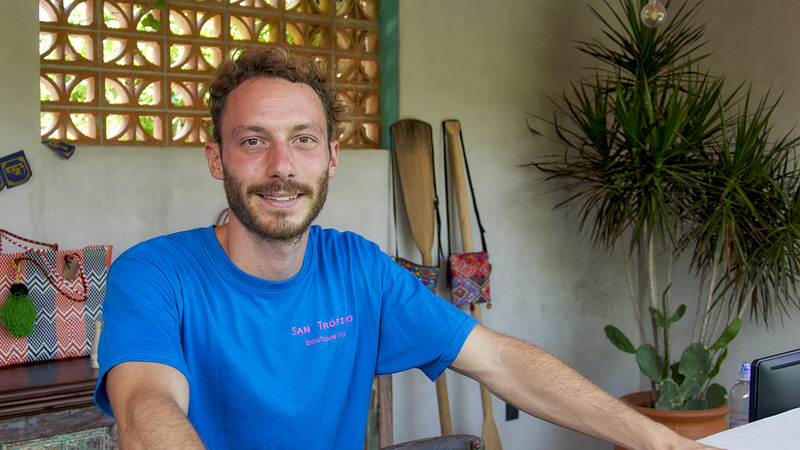 Encouraged by the opportunity to explore the place, we connected with Carlos Pérez, the young and friendly entrepreneur behind San Trópico, who gave us a tour through the property and direct access to its amenities. Originally from Mexico City and with previous experience in the hospitality industry, Carlos moved to Puerto Vallarta two years ago along with his father, to start the project. “We repurposed these buildings, a former condo complex, and created all the spaces, ambiances and amenities you now see. 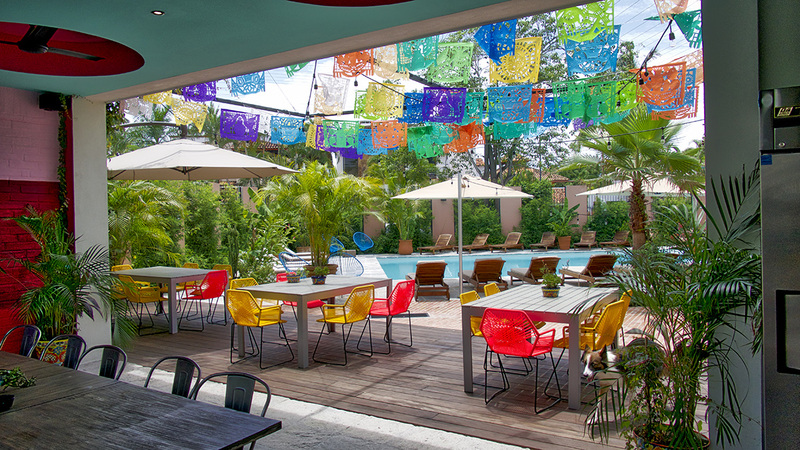 We wanted San Trópico to represent Mexico, so we included elements such as the Acapulco style chairs, traditional colors, and the Mexican papel picado ornaments in the common areas,” he explains. 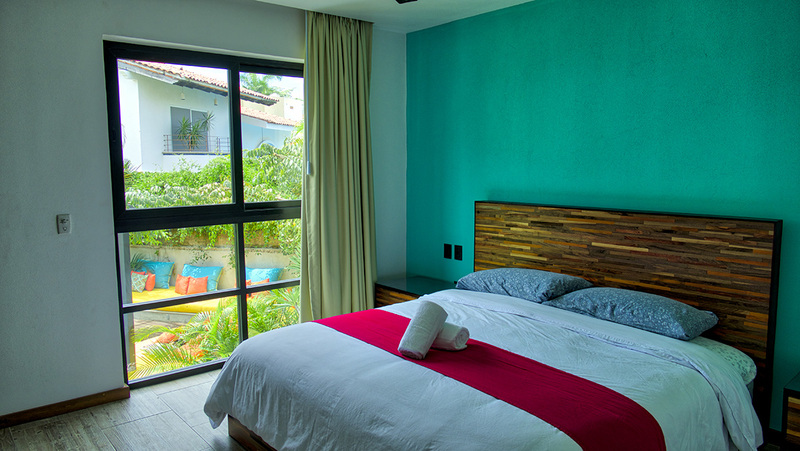 At San Trópico, guest will have a relaxing experience. 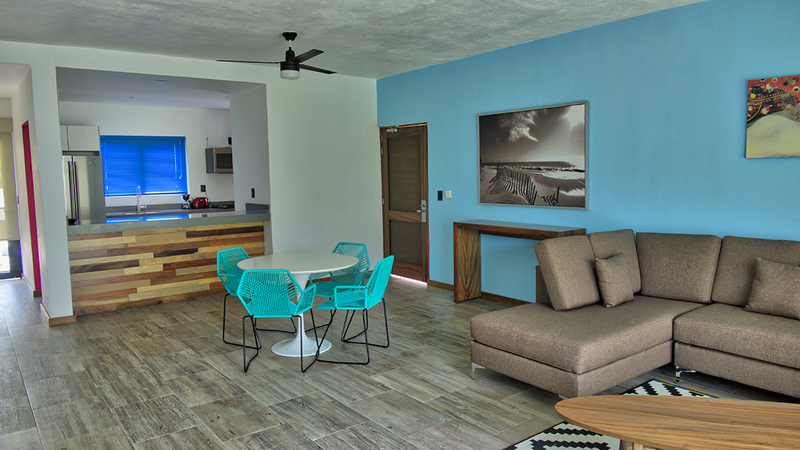 This charming and spacious villa is a unique surf and yoga resort nestled between the beach and the beautiful neighborhood of Marina Vallarta. Click on the photos below and take the tour! 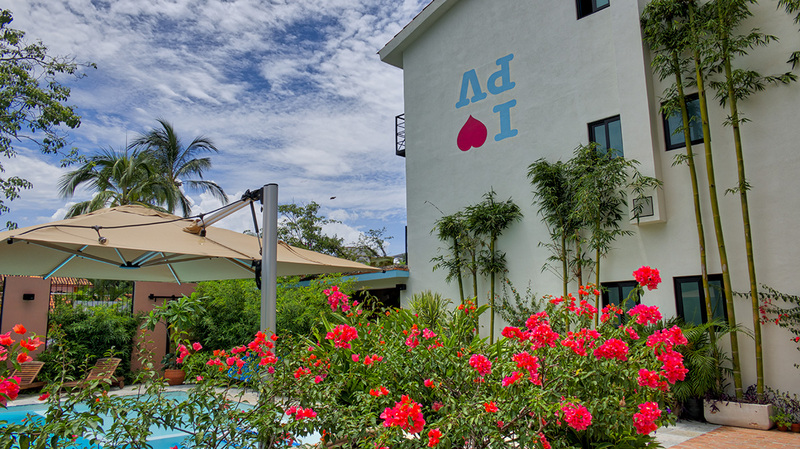 From the outside, the boutique hotel has a contemporary look, while keeping the elements of traditional architecture. Integration with nature is an evident priority. 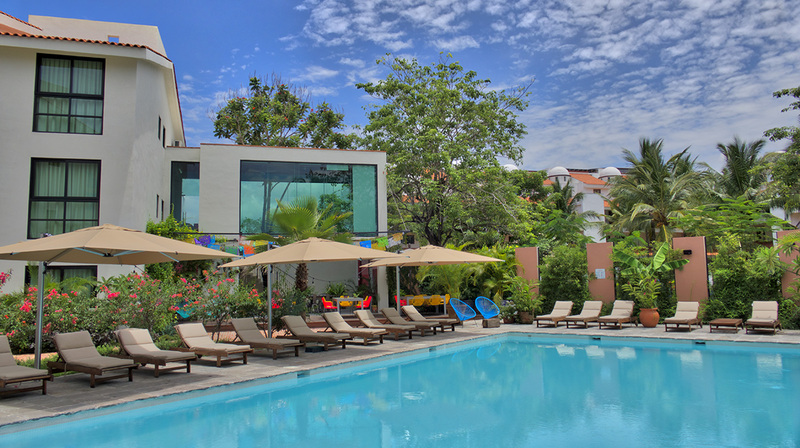 The pool area is spacious and features comfortable and shaded lounge chairs. 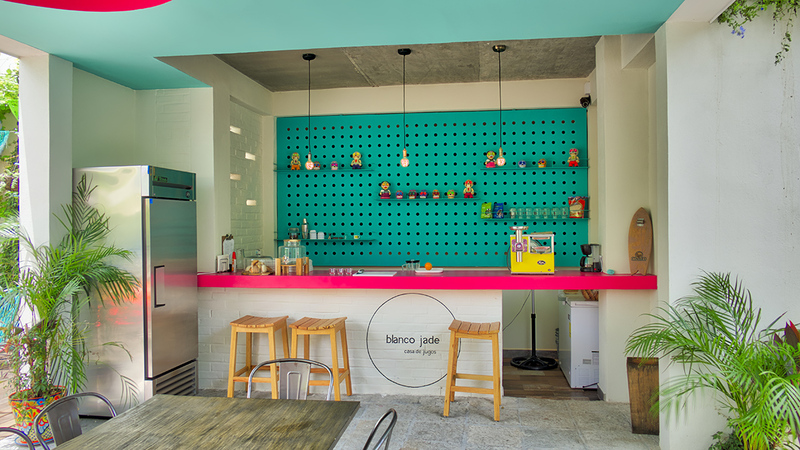 Blanco Jade is the name of the in-house juice bar featuring healthy paninis, smoothies, salads and juices. It features a state-of-the-art cold-press juicer that enhances quality by maintaining the fruit nutrients. The eatery is open from 8 am – 8 pm. The view towards the pool area from Blanco Jade. If you look closely enough at the bottom right hand corner you can see our new friend Sunny, the house pet. Yes! The hotel is pet-friendly! 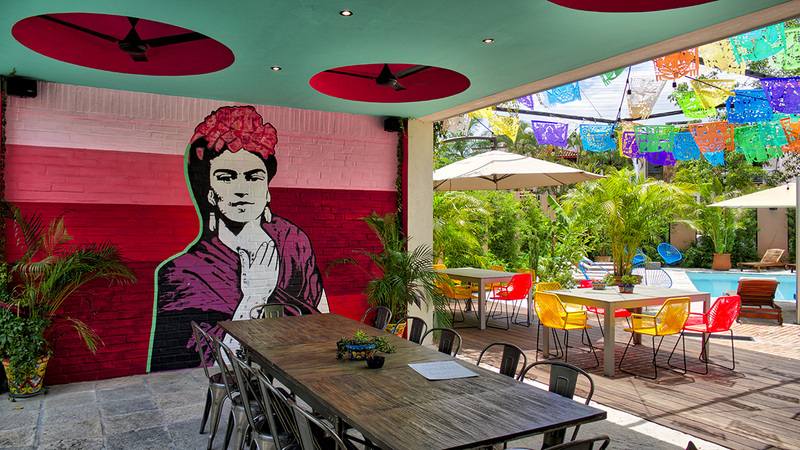 The gorgeous Frida Kahlo mural at Blanco Jade juice bar is so instagrammable! Wi-Fi throughout the entire property helps. Choose to enjoy your panini and juice at the Blanco Jade contemporary style dining room or at the adjoining area that features Acapulco style chairs. Aren’t these Mexican Munny art toys awesome? – Superfoods also available at the juice bar! 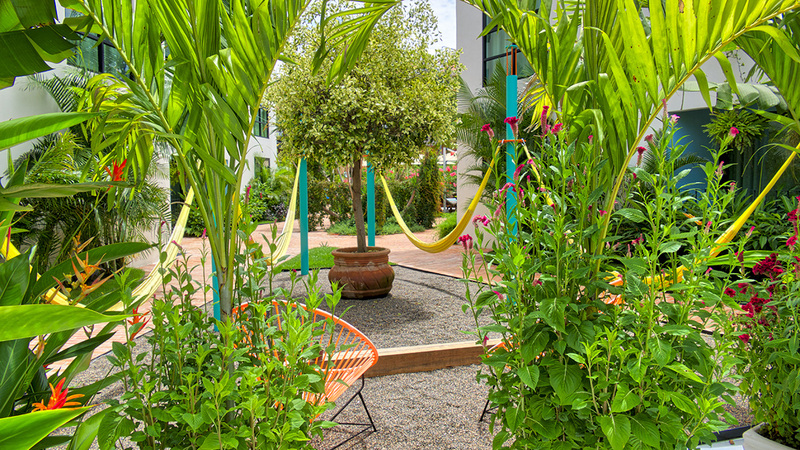 The hammock zone at the center of the compound is the perfect place to chill after a swim in the pool. The complex offers 14 suites featuring living room, dining room, kitchen, bathroom, two spacious bedrooms with their own flat-screen TV, air conditioning and a contemporary design. 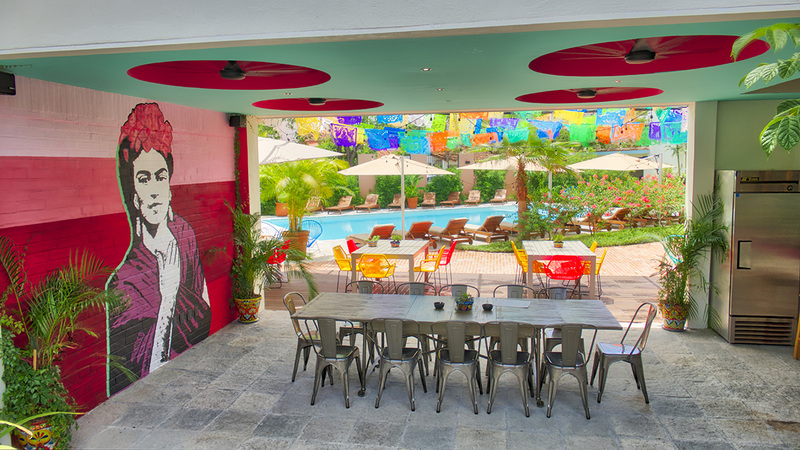 All suites have Mexican names, such as Catrina, Frida, Luna and Reina. They can be rented by night, week or a longer period of time, and they have a capacity for four people. 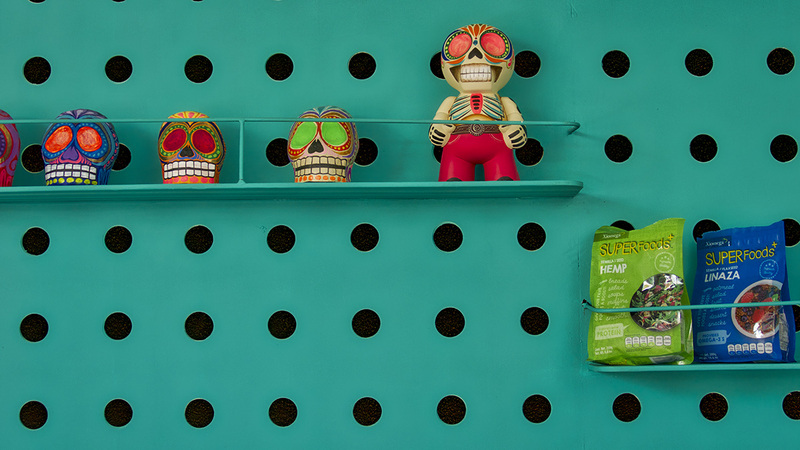 Puerto Vallarta’s local folklore is playfully acknowledged on the walls of the hotel. Carlos Pérez, owner and director, at the hotel’s reception, ready to offer a friendly welcome. San Trópico features a yoga studio with ongoing classes during the day by the American master and meditation teacher Wayne Krassner, instructor of international celebrities such as Madonna, Lenny Kravitz and Sylvester Stallone. Classes are $150 pesos per person for visitors, who can also purchase a monthly, unlimited membership for $1,600 pesos. Hotel guests can join the classes for free. The yoga studio features a nice view towards the pool area. 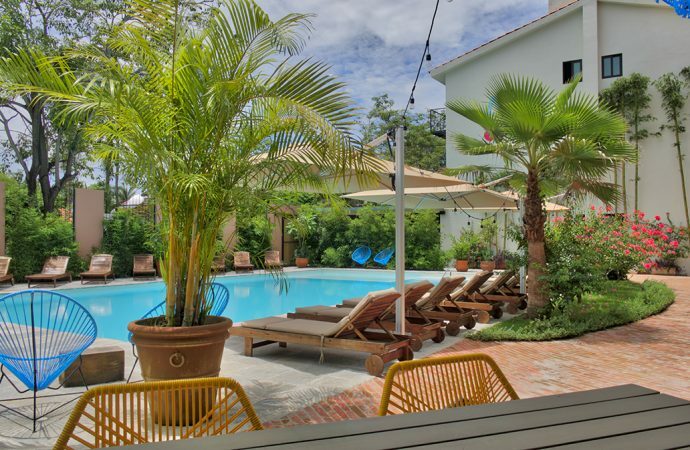 Very much to our fortune, San Trópico boutique hotel also offers a day pass program for locals who want to spend a day or afternoon enjoying its amenities, whether you choose to enjoy the pool or the chill-out area by the hammocks. The day pass is $100 pesos for locals and $150 for visitors. All common areas have wireless Internet connection, so feel free to share your favorite spots. San Trópico is scheduling ongoing events, such as yoga meetings, pool parties and bazaars. Make sure to follow their Facebook Page so you can stay updated about upcoming events. 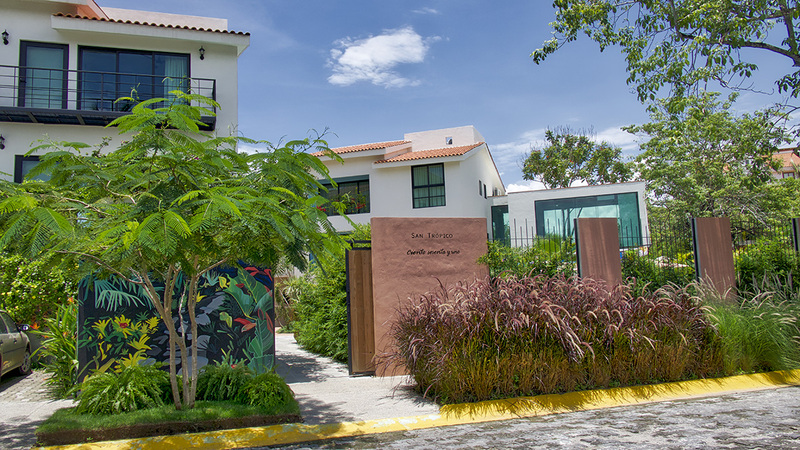 San Trópico boutique hotel is located at Flamingos 161, in Marina Vallarta. For more information and booking, please visit their website or call (322) 221-3552. Enjoy a video we’ve prepared for you and watch how the amazing juicer at Blanco Jade serves healthy, ready-to-drink juices.